Byker Masonic Hall’s 2CC (2 chosen charities) team present this year’s 2CC Music & Laughter Show – a real fun-packed, value for money afternoon, starting at 1pm with over 3 hours’ worth of top entertainment. 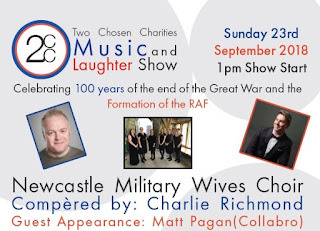 2CC are hoping the charity event, a good old fashioned variety show, back after a hugely successful show in 2017, will deliver even more music and laughter, raising money for two chosen charities, namely the Tyne Theatre Preservation Trust as well as SSAFA (The Armed Forces Charity). 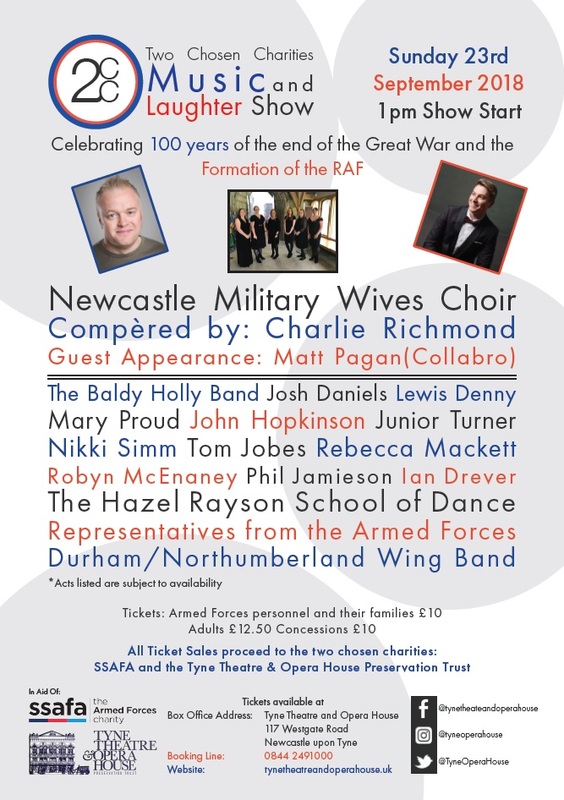 We are celebrating 100 years from the end of the Great War and 100 years from the formation of the RAF with this years show having a military twist to it. With a host of fantastic acts to be announced very soon, the 2CC Music & Laughter Show promises to be a hilarious, toe-tapping treat, set against the incredible backdrop of one of the North East’s best-loved entertainment venues, with many brethren giving their time up for free. Matt Pagan – a member of Britain’s Got Talent winners Collabro, Matt also played the Prince in Tyne Theatre & Opera House’s Christmas Panto 2017. He’ll be reunited with fellow Panto stars Charlie Richmond, Lewis Denny and Robyn McEnaney! Charlie Richmond – Panto legend and one of the Tyne Theatre’s favourite sons, Charlie, a talented singer, actor, comic and all round nice guy will be our compere for the day, as well as purely belting out a tune or two during the day. Durham/Northumberland Wing Band – Part of the Durham/Northumberland Wing Royal Air Force Air Cadets. The Cadets within the band are from various squadrons within the Wing which covers a huge area – from Berwick in the north to Hartlepool in the south. Junior Turner – It’s been a busy and successful year so far for Junior Turner. After his appearance at Northumberland Live and winning two awards for his single “Tonight”, he has also gone number 1 for the very first time in the UK unsigned charts. Jason Cook & Steffen Peddie -Two of the finest comic talents the North East has produced from TV hit Hebburn and Geordie Rat Pack fame. Military Wives Choir – The MWC provide a head-start for women in the military community to make new friends, connect with local communities and learn new skills in a fun and supportive environment. John Hopkinson – Multi-talented musician, singer, song writer, member of the highly successful Moon Beats and overall good guy. Both singing his own songs as well as accompanying many of the acts including the Military Wives Choir. Lewis Denny – Another popular member of the Tyne Theatre Panto team, the very talented and versatile Lewis will be treating us to his own song in the show, as well as supporting Rebecca Mackett and joining in with other members of the cast in the final section of the show. Nikki Simm – On stage, behind the scenes, front of house, Theatre runs through this girls veins. As well as performing her own song, she will also be supported by Lewis in her 2nd song of the second act and as part of the cast in the final part of the show. Mary Proud – Choreographer for the show and highly respected member of the Hazel Rayson Dance School, Mary will be singing her own song in part two. Rebecca Mackett – Singing her own song in the second set, accompanying Matt Pagan in the final section as well as being part of a female four piece, she’s sure to blow your socks off. Hazel Rayson Dance School – Big supporters of the Tyne Theatre, The Hazel Rayson Dance School will be providing skillful dance routines to accompany several of our acts. Tom Jobes – A regular to the show both as performer and compere in the past. It’s great to see Tom back on stage knocking out a few lovely songs. The Baldy Holly Band – Fresh from tours of both the USA and more recently Scotland, one of the country’s finest Rock ‘n’ Roll bands will be storming the stage with their fire brand of Rock ‘n’ Roll classics. Ian Drever – A regular on stage, Ian, a highly experienced performer, is sure to put a smile on the faces of some of our Military and public audience alike. Robyn McEnaney -Winner of Panto 2017’s ‘Search for Snow White’, Robyn will be once again teaming up with Panto colleague Matt Pagan. Phil Jamieson – This talented guitarist will lead off the finale with a guest appearance accompanied by John Hopkinson (Keyboards), RAF Wing band rep (Drums) and the Durham/Northumberland Wing Band. Tickets are priced £12.50 adults, £10 concessions, £10 armed forces & their families (Plus booking fees when booking online or over the phone). Online – tickets are available from our affiliate Eventim UK: http://bit.ly/2CCtix.